As the comments on this page show, this is a controversial topic. I do hope that most readers will perceive I don’t actually hate Hinduism or individual Hindu’s. This page was made in response to Hindu’s claiming Buddhism is really Hinduism. Nothing more. I choose Buddhism myself, after having studied both for over a decade. I do feel that as a spiritual path Buddhism is the cleaner choice. However, I also realize that it’s not for everyone. Ultimately what decides a person is not the religion they identify with, but their actions, their words and their thoughts. There are excellent Christians, Muslims, Jews as well as Hindus. People like Mother Theresa, Gandhi and Rumi make me almost sorry I can’t join their faiths. However, living in this world choices have to be made. I made mine for the following reasons. It always annoys me when Hindu’s show up on one of my online projects to announce – as if to make it harmless – that Buddhism is (merely) a form of Hinduism. I guess this thought goes a long way to explaining why so few Indians bother to learn from Tibetan Buddhist teachers living in their country, while Westerners travel long distances to be with those same teachers. Still Hindu’s have a point of course: Buddha was born in what’s now Nepal and lived and taught in the north of what’s now India. On the other hand, Hinduism as we now know it didn’t exist yet 500BC. Sure, some of the ingredients were in place, but many weren’t. In fact, Hinduism as a unified religion is a rather modern invention that is still more a construction (of Western origin) than a social reality. That is: Hindu’s believe in 1000s of Gods, but each individual Hindu is devoted to only one (up to a dozen) which are all seen as emanations of One Ultimate God (usually some version of Shiva or Vishnu). Buddhism and Hinduism share a common Indian heritage. However, that is not enough to declare Buddhism a form of Hinduism. Just like Christianity is not a form of Judaism. The precise meditations are different of course. The main difference between Buddhism and Hinduism is the same as the main difference between Christianity and Judaism: whereas Hinduism is a tribal religion, Buddhism is equally accessible to people from any background. Before Hindu’s jump down my throat at the use of the word ‘tribal’, let me explain what I mean. A Hindu is defined primarily by their birth, which explains why they’re so quick to include Buddha by the way. You’re a Brahmin, a Kshatriya or a member of a scheduled caste by your birth. These days there are all kinds of political consequences to this fact. A Buddhist is anybody who has taken refuge in the Buddha, Dharma and Sangha. That is: you become a Buddhist by choice, comparable to how it works in Christianity and Islam. Like Islam and Christianity, Buddhism is a world religion: it is accessible for everybody and hopes to help every human being (actually every sentient being) towards its version of salvation. There is NO claim that Buddha is the primal source of all being. Buddha was a man who attained enlightenment, that’s all. Sure, in Mahayana Buddhism ‘Buddha Nature’ is all pervading, but it’s still a long cry from a creator God like Brahman, Shiva or Vishnu. The reasons for devotion are also different: a Buddhist seeks refuge of the Buddha in hopes of help on their path to their own release from the cycle of rebirth. Hindu’s are devoted to their God out of Love and devotion. That doesn’t mean that a Buddhist isn’t devoted to Buddha, nor that Hindu’s can’t actively work on attaining Moksha: it’s a difference in degree. Of course there is one other stickler point: the caste system. There is a reason Ambedkar stimulated whole groups of people to convert to Buddhism: to escape the Caste system. I don’t know if it worked, since jati’s are a built in aspect of Indian society (as well as of Nepal and Pakistan). Just giving your group a different label doesn’t make the system go away. However, the caste system IS supported by Hinduism in a way that it isn’t in Buddhism. Through writing this page I realized just why the difference between Hinduism and Buddhism seems so slight to Hindus: there seems to be very little that Buddhism has to offer Hindus that they don’t have in ‘other’ Hindu teachers. For me, and most Western Buddhists I think, the situation is different: Buddhism offers a path that stresses meditation AND ethics, whereas Hinduism and Yoga seem to be about reaching salvation in ways that do NOT stress the importance of love for your fellow human being. This doesn’t mean ethics and loving kindness aren’t present in the religion,Hinduism, merely that those aspects don’t get exported to the West as much. Also, of course, as a Westerner I can never REALLY become a Hindu. I might become a yoga teacher, or a Krishna devotee, but that doesn’t make me a Hindu. I can however, like any human being, become a Buddhist. In fact AM a Buddhist. What it boils down to is this: I as well as every Buddhist world wide, have a right to identify with Buddhism as not Hinduism. I have a right to enjoy the benefits of an Indian spiritual tradition without there being the implicit confirmation of the caste system. I have a right to believe that Buddha was NOT in incarnation of Vishnu, as many Hindu’s insist. Buddhism IS a form of Hinduism, they say, because Buddha lived in India didn’t he? Just watch BBC documentary. Budda was born as Hindu. Every thing budddha taught already in Hindu scripture. Hinduism is vast and complex religion. It is mother to all world religion. As a Westerner myself, I kinda understand Indians who say this, because this categorization business is, as you mention, really a 19th century western activity. so to dismiss that , I think they are right in saying that is it really the same category. I have read most of the Hindu scriptures and I can say with certainty that Buddhism IS a form of Hinduism. Everything the Buddha taught can be found in Hindu scriptures that existed thousands of years before him. Like it or not, Buddhism and Hinduism are two sides of the same coin. The main difference between the two is Hinduism revolves around the concept called GOD, whereas Buddhism revolves around MAN. Man himself has to redeem from suffering and in Hinduism its GOD is the means for salvation. Buddha Witnessed the cages. Ritual without purpose. A way to see what is and the cycle, and find ones true state. Buddha adapted teaches to fit others to find the path, and that included taking hindu idea and putting them into a symbolic meaning to reach the goal. THis was adapted for those people. While Diamond Way will show those means to the advanced that need it, it isn’t something for everyone. Hence the guided approach to faster clarity. I never thought that Buddhism and Hinduism were related at all besides being Eastern religions. Quite interesting that Indian people believe that. I think your analogy of Christianity to Judaism is apt here. Very informative article. I lived in China for over 8 years, and I never saw the Buddhism that I read about in books. It was a mix of animism and Buddhist deities. But then again, when you look at “Christian” people, you rarely see what is described in books as the orthodox practice. I agree with you Buddhism is not part of Hinduism. Prince Siddharth was a Hindu king, who denounced his kingdom (and Hinduism) to essentially start Buddhism. However your statement that Hinduism is only a modern invention is the biggest load of ignorant crap I have ever seen in my life!! By the logic the whole concept of organised religions is a modern construct. Hinduism is a way of life. The mantras and poojas we recite date right back to the Vedas. Which contrary to British written History, originated from India. Whatever the customs were have remained till now (some good, some bad)…They might not have known it was a religion at the time, however looking back at it through 2012 perspective, it was very much a religion. You are obviously a passionate Buddhist. But i think its ignorant and stupid of you to attempt extol the (wonderful) virtues of Buddhism by spreading your obvious ignorance and bringing down Hinduism. The issue isn’t whether Hinduism is a religion today, but whether there is anything UNIFIED that could be called Hinduism that goes back 3000 years or so. The concept of Hinduism is really a Western invention, even if modern Indians have adopted it (and politicized it). I did study Indology at university, I’m not just inventing this stuff. You’re right though that the idea of puja goes back a long way. It goes back long enough that it’s present in Buddhism too, in fact. I suspect it’s part of all Indian religions. The issue I try to present here is really: do Hindu’s have a right to claim that all religions originating on the Indian subcontinent are really Hinduism… and my answer is: no, they don’t have that right. I have no quarrel with Hindu’s who agree with that point, especially if they concede that the whole caste system is a problem (however hard to solve). I agree with you,Spirituality. Hinduism is characterized by shared scriptures, but the Buddhists have their own scriptures and so are a different religion from Hinduism. Watts’ mistake arises from the fact that Hinduism and Buddhism belong to the same branch of world faiths, the Indian Stream, but concluding, wrongly from this basis, that faiths within this stream can be reduced to Hinduism, but this makes the major logical error of Reductionism. Anyway, Buddhism was developed with no thought of the West in mind,so how could it be a faith repackaged for the West? Anyway, why take Watts’ word uncritically. Everyone, you, I, the pope, etc, should be listened to respectfully, but critically and then evaluated. Watts is learned, but he is not a guru. I can understand that. He’s a big name in popularizing Buddhism in the West. However, in terms of Buddhist scholarship, he’s also very much outdated. Alan Watts was involved, not so much Buddhism as it existed in Asia, but with the Buddhism he was introducing in the West. That quote says something about the brand of Buddhism he was introducing. It also ignores that the audience Siddhartha Gautama spoke to were obviously the inhabitants of India. Most people who call themselves Buddhists live in Asia. So Alan Watts is blatantly ignoring most of Buddhism. It is more fruitful to see religions as elements in a broad stream in which different components flow and mingle. Hinduism and Buddhism, along with Jainism belong to the Indian stream, but they are different. What seems to be common to this stream is a cyclic world-view and derived from this a belief in a potentially infinite series of lives. What is currently called Hinduism groups people together who worship a very large collection of Gods. Some worship Shiva as the main God, others Vishnu or Kali. Some are vegetarians, others perform animal sacrifice. To be Hindu you must accept Hindu Scriptures, which bind Hindus together. As Buddhism does not accept these Scriptures, but has its own, Buddhism cannot be part of Hinduism. Furthermore, Hindus accept the ritual services of Brahmins, but Buddhism does not use them. Hindus speak of reincarnation, which involves the atman [soul] returning, whereas Buddhists speak of rebirth, which involves the return of the atta [consciousness and its karmic effects]. Whereas in Hinduism you are reincarnated, in Buddhism, what is reborn is neither you nor not you. Hinduism does not have the four noble truths upon which Buddhism is based. The word Hinduism might be a relatively new term, but what we call the religion Hinduism today was known as Sanatana Dharma in ancient times, and this word is even used today. Sanatana Dharma or Hinduism was rather seen as a way of life, and this is mentioned in vedas and puranas which were written way back. Well, Hinduism as such didn’t really exist back then. It’s a 19th century umbrella term. The poll options state nothing about what was in India before the Buddha – in fact, that’s opening a whole other mine field of controversy. I could not agree with either of the Poll options. You are right that Buddhism does not worship a God and Hindus worship many Gods. 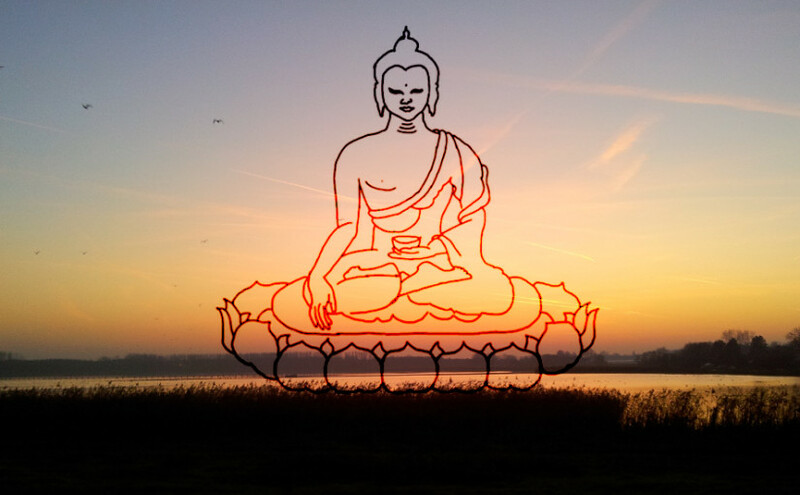 But before Buddha there was NO Buddhism – he created it and yes, he was born a Hindu. I’d have to disagree that Hindu’s are only people born in India. AND that it isn’t about love. I didn’t follow the Buddhist path myself because many branches do not recognize a supreme being. Buddhism as an offshoot of Hinduism exactly as Christianity was of Judaism. Previous Previous post: Mixing religion and politics?